Dr. David Hazzouri has been practicing restorative and cosmetic dentistry in northeastern Pennsylvania since 1995 and is currently a Highmark, Blue Cross Blue Shield Medical and Medicare Participant. While he is committed to providing patients with the latest technology and cosmetic dental techniques, Dr. David takes the time to develop a personal relationship with each of his patients. By understanding your unique dental needs and goals, he can develop a personalized dental enhancement plan that works best for you. 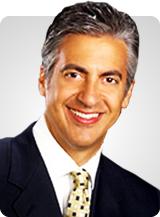 Dr. David is a former clinical assistant professor at the University of Pennsylvania Graduate Clinic and Implant Center. He earned his dental degree from Temple Dental School and his dual graduate certification from the University of Pennsylvania in fixed prosthodontics (cosmetic dentistry, crowns, bridges) and periodontics (implant dentistry). I think my dentist is great. And not because he’s my cousin. It’s because of his work. When I was ready to restore my smile, the only person I trusted was David Hazzouri. I know so many people who are very pleased with what he’s done for them. Because he is a perfectionist. Plus it’s painless. And affordable. I love my dentist. Because David Hazzouri has world-class talent. He practiced on Park Avenue. Taught at the University of Pennsylvania. And has an office on North Washington Avenue in Scranton. And I have no pain.